We proudly present the ultimate in comfort 4 Compartment Portable Sink designed for cleaning cooking vessels, utensils, and wash hands or clean wipes and cutting machine. It is constructed with heavy gauge 304 stainless steel body and has sliding cabinet doors and sides made of sturdy and durable environment friendly colored Aluminum Composite panels, prepared to tackle tough and harsh outdoor weather conditions. 4 Compartment Portable Sink bowls are made of corrosion free environment friendly metal. There are two separate swivel and turn faucets to aid in comfortable cleaning and rinsing. The provision of hot and cold running water is powered by 110VAC power supply point. Easy water fill and drain provision for storing 5-gallon fresh water and 7-gallon wastewater after use. 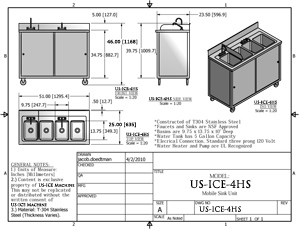 The 4 Compartment Portable Sink has compact and swanky shapes and designs are meant to occupy minimum space, polyurethane safety-locking system casters with extra brakes for added support and steady operation are incredible. Please note our flat rate shipping is valid for internet orders and commercial address deliveries with loading dock or forklift. Carriers charge extra fees for residential and/or lift gate services.